College planning is a common concern our clients have when developing a comprehensive financial plan. 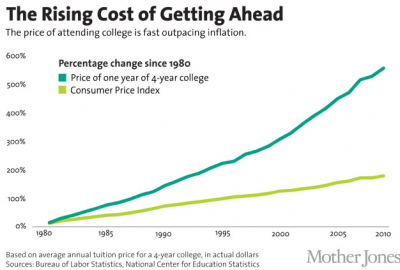 It is getting more and more difficult to plan for college as the cost has been increasing at twice the rate of inflation. In 1996, Congress responded to this burden by creating the 529 College Savings Plan, of which there are two types: 1) Prepaid Tuition Plans and 2) College Savings Plans. Prepaid Tuition Plans allow you to lock in current tuition rates for enrollment in the future. Many states and private institutions offer this type of plan. However, we don’t typically recommend them to our clients, as they have a few drawbacks which make them less appealing. Your child may not want to go to the school of your choice or may not be accepted into the school. If this happens, you may able to transfer the account value to another school but you may not get the full value depending on your state. Furthermore, these plans only pay for tuition and fees and cannot be used for room and board. College Savings Plans allow the owner of the account, usually the parent or grandparent, to contribute money into the account for the benefit of a child. The child beneficiary can be changed at any time to a person related to the initial beneficiary. The owner of the plan cannot manage the account directly but they are able to choose a manager and investment strategy. 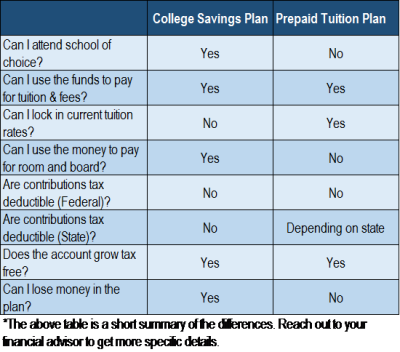 College Savings Plans have a lot more flexibility when compared to Prepaid Plans as the funds can also be used to pay for room and board. However, if funds are withdrawn from the account for non-educational needs, the earning will be subject to a 10% penalty on top of your marginal tax rate. College Savings Plans allow a family to front load the funding and contribute $140,000 in a single year. While these plan can assist in estate planning, we typically like our clients to invest smaller amounts into 529 Plans on a systematic basis over time. Furthermore, we encourage them to start saving while their children are young so there is time for the investments to grow. Section 529 Plans are a great vehicle to save for college. At surface level they appear to be very simple to administer. However, there are many nuances to the rules which can be tailored to your needs. Contact your financial planner to help guide you through the rules to find the best plan that addresses your particular situation. David Bryant is an Associate Financial Planner with Manchester Financial, an Investment Counsel/Wealth Management firm located in Westlake Village. For more information call 800-492-1107. This entry was posted in Financial Planning, Uncategorized and tagged 529 Plans, College Savings. Bookmark the permalink.